With so many things to do in the greater LA area, like the Ronald Reagan Presidential Library and Museum right here in Simi Valley, you won’t want to waste a minute trapped in your garage by a broken door motor or mechanism! Fortunately, you can call in the experts at Carroll Garage Doors for help with your garage door repair Simi Valley CA and get on the road again fast. Our technicians undergo extensive training before they ever touch your garage door. We make sure they know how to perform even the trickiest repairs on all kinds of garage doors Simi Valley CA. Our staff is equally comfortable performing standard repairs on name-brand doors like Genie, Unique, Liftmaster, Amarr, and Wayne Dalton, or thinking outside the box to solve the unique problems that come with custom-made doors. When it comes to a tricky and potentially dangerous problem like broken springs, you definitely want a technician you can trust. 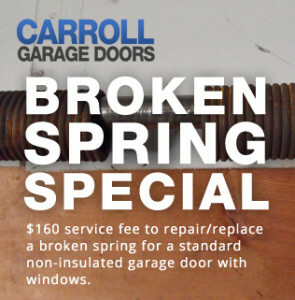 When you call Carroll Garage Doors, you can rest assured that the person we send will arrive quickly, follow proper safety procedures, and have your garage door up and running again in no time. 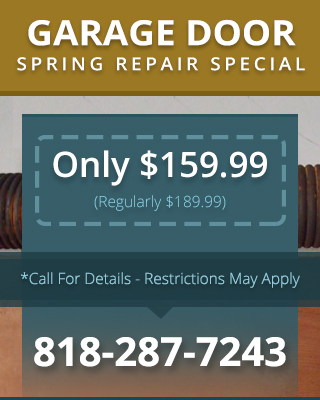 If you need garage door spring repair Simi Valley CA, don’t hesitate to call us.